It's a dying world that is afraid. An aristocracy living on borrowed time that knows nothing will ever be the same again as before. In the Punjab governor's sumptuous palace, visitors are escorted from anterooms to reception rooms by servants wearing violet tunics and complicated turbans reminiscent of the Indian Empire era. Sideboards groan under spiced sweets and cardamom puddings. Governor Salman Taseer, a PPP member clothed entirely in white, is delighted with the new functions he enjoys since his friend Asif Ali Zardari, Benazir Bhutto's widower, became Pakistan's president. Is not Punjab (with 60 percent of the country's population) Pakistan's most important province, and, most particularly, the army's fiefdom? Salman Taseer listens to himself speak on television, tries on his Astrakhan hat for indulgent friends. He'd like to see his portrait on the wood-paneled walls of this boardroom where two British governors are already on display. But nobody is taken in. Not even his wife, who has undertaken the palace's restoration to its imperial splendor: "What's the use? And for how long?" she sighs, one does not know whether over the difficulty of removing the ocher dust from the recesses of this immense house or over the political situation of her husband, whom opposition party head Nawaz Sharif's minions dream of supplanting, or over the repercussions of the economic crisis, which has brought the Pakistani government to the verge of bankruptcy ... or over Islamic terrorism forewarning civil war. Just as the women nervously squeeze their bags of jewels matching their nail polish, the governor relates what happened "that night," September 20, 2008, when the Marriott Hotel, a veritable Islamabad institution, was shattered by a great explosion that killed over 60 and wounded over 200. What editorialists baptized "the Pakistani September 11," hoping that the terrible event would arouse a massive rejection of Islamic terrorism ... which did not occur. "In the presidential palace, the noise was such we believed we were the target of a rocket attack. We were smoking Romeo and Juliettes and I said to the president: 'Let's enjoy our cigars; these are our last ones.'" Elsewhere, in another salon of Lahore's higher bourgeoisie, the weakness of the new president's hold on power - contested even within his own party and distrusted by the army - and the war underway in the tribal zones provide the substance of conversations. Without forgetting, naturally, the attacks that now extend well beyond the regions bordering on Afghanistan, affecting even Lahore, the most peaceful city in Pakistan. The party ends on the melancholy accents of a qawwal singer, whose mystical incantations the women take up, when, suddenly, Imran Khan, former captain of the national cricket team and a popular idol since Pakistan's victory in the 1992 World Cup, bursts in and, without any ceremony, imposes silence on the Sufi artist. The former champion, a member of Parliament, lays out an appalling picture of Pakistan's situation: "The majority of Pakistanis who come to see me think that the Americans are in the process of making war against Islam and that we must support the Taliban. And the army, hard hit by the economic crisis and which wages this war grudgingly, is on the verge of revolt. In the Qorum tribal region, Shiites, supported by Iran, are fighting Sunnis. Al-Qaeda is in the process of succeeding beyond its dreams ..."
"What must be done?" a desperate guest asks him. "The Americans must leave," the cricketer answers, quick as a flash. Resentment against the West and the American ally is never far, even in these milieus where almost everyone has dual Pakistani-American citizenship, just in case ... As with this frontline politician who protests his loyalty to "his American friends," but is exasperated by the American Ambassador - omnipresent in the power circles of this high-risk country - Anne Patterson's recent visit. High-risk Pakistan possesses the atomic bomb, shelters al-Qaeda's general headquarters and boasts empty government coffers. "The ambassador repeated to me that we must liquidate all the extremists. As though that were easy!" the politician protests. "The Americans don't understand anything about anything. What are they going to do? Launch B-52s into the tribal regions? That place is not Pakistan and they want to send us in to clean it out! You have to know that the people who live there don't have our laws or our customs: if you kill a resident of that region, he will be revenged, even five hundred years later ... This war will never end." Four hundred kilometers northwest of Lahore, Peshawar is another world. Here, in one of the country's oldest cities, at the eastern extremity of the Khyber Pass, is where the Taliban and the country's secret services in the region have elected to take up residence. Over the last several months, one also finds here a good part of the refugees, who have fled the war without spectators underway in Pakistan's border regions. 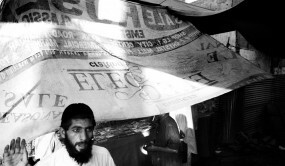 They are there, brought together under the fragile and precarious shelter of the UN High-Commissioner for Refugees' s tents - collateral victims of the war against terror, whose numbers continue to climb ever since Afghanistan's occupation by NATO troops. The authorities estimate that close to 200,000 people have fled the fighting raging in the Bajaur region bordering the Afghan Konar. In the several villages they were able to retake from the Taliban, the Uzbeks, the Tadjiks and al-Qaeda's Arab "volunteers," the Pakistani army discovered an incredible interlacing architecture of underground galleries fitted out with ventilation systems that broadly explain Islamist fighters' resistance to that military operation, the most significant since the United States made Pakistan its ally in its "war against terror" in 2001. The stories of men who had just arrived from their Bajaur village, lucid and desperate, clearly explain Pakistan's double game up to the present. Like this one from Mohamed Zaer, imam of the mosque in the Charmang village: "It would have been so easy to arrest the Taliban in my village. But up until now, the government supported and financed them ... and then the United States increased its pressure: everything you see here is a performance for the benefit of the Americans: me and the UN tents, we're part of the décor!" Babar Sharmaz, a Bakhtiar peasant who just arrived in Peshawar during the previous night, has bloodied hands. Along with a group of villagers, he destroyed a bridge to cut the route from the Taliban: "We went to find the border guards to ask them to help us get rid of them, but they didn't do anything!" Like most tribal region inhabitants, Sharmaz thinks the Pashtuns are victims of a Pakistani government conspiracy: "When there's a little attack in Islamabad on the Marriott, every television screen in the world shows it in endless loops, but no one cares about the death and destruction that reign everywhere in the tribal regions ..." In his comfortable Peshawar house, Brigadier General Mehmud Shah, who was the head of security for the tribal regions until disagreements opposed him to the all-powerful secret services, acknowledges that the situation in the tribal regions is about to reach a point of no-return: "The Americans have got to understand that Pakistan's sovereignty is in play at this time." How did things reach this point? "Up until 2006, I more or less succeeded in controlling the situation in the tribal regions by relying on the tribes," the general confides. "But starting in 2006, President Musharraf became so weak he had to make deals with the clerics to win their electoral support and the situation became uncontrollable ..." The brigadier general describes an extraordinarily complex situation in which the different leaderships of the secret services and the army made fool's bargains with the different extremist groups, without any consultation and often with nothing but a simple concern for their own professional advancement. "During that time, the Iranians armed the Shiites to fight our soldiers; warlord Rachid Dostom mobilized the Uzbeks and the Indians supported other groups to drag us into civil war." Is the pacification of tribal regions still possible? "Yes," answers the officer. On the condition that the Americans quit bombing villages whenever they think they have some intelligence: "Since August 2008, the Americans have conducted over 20 bombing raids in the tribal regions and at least one land operation. In the majority of cases, they did not strike their target, but civilians ..."
According to General Mehmud Shah, President Zardari has no choice but to collaborate with the Americans. The question today is to determine whether his political weakness is not already constraining the new president - as it did his predecessor, Pervez Musharraf - to make some agreements with the fundamentalists - who hate him. Zardari has already authorized reconstruction of the Red Mosque, razed in July 2007 because it had become a jihadist bastion in the heart of the capital, a center of Koranic studies the students of which did not hesitate to kidnap citizens in the name of holy war. Today, the mosque's dome is white, but the memorial to the Red Mosque's martyrs that it harbors and the discourse of the faithful, who all remain in contact with the mosque's former maulana (a friend of bin Laden's), clearly show that the Taliban and al-Qaeda are still protected here against a government the imminent disappearance of which is forecast.